Bornos has an extensive cultural heritage. Most of its monuments are from the Renaissance period. It is well known as "the gate of white villages". The Guadalete River offers the visitor the possibility of practicing numerous sports and, in addition, the surroundings of the mountains are a good option for hiking. 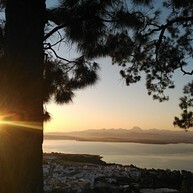 Try traditional cuisine in restaurants or live Carnival or Easter, both declared of Cultural Interest in Andalusia. Colegio de la Sangre This school-hospital was a wish of Don Perafán de Ribera but was commissioned by his son, Saint Juan de Ribera, as executor of his father's testament. The building was completed in 1597 and presents a one level structure, with a central yard around which were distributed the living and working chambers. There once were rich orchards and gardens in the South Wing. This school was intended to home twelve noble Squires retired from service to the House of the Lord Duke, and other men good and of clean blood, also from his States. Nowadays, having been refurbished by the City Council, one part is used as an extension by the Institute of Secondary Education "El Convento"; the other function as a Child Care Centre. This Orchard presents unequivocal Renaissance characteristics which without reaching the purity of the style of Villa Belvedere (1503) in Rome or the grandeur and beautiful complexity of the Boboli Gardens (1600) in Florence, offers an enchanting example of this style of garden which is quite unusual in Andalusia. The characteristics defining this garden are as follows: The evident close relationship between the main building and the garden. Its design is of a regular and geometric shape, distributing the space in symmetry to a geometric axis. The land is partitioned in different levels of successive terraces connected by steps which level out the gentle slope of the ground. In this case four different levels can be appreciated thanks to the steps and the trimmed hedges. The streets are straight and intersected, the linear shapes predominating over the circular ones which, although to a lesser extent, also appear. This geometry is reinforced in some parts of the garden by the floor paving designs made with washed pebbles, possibly from the same era as the garden. Natural materials and plants are considered one more element of construction, giving them shapes in such way that nothing retains its original conformation. 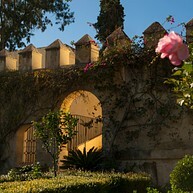 In contrast, you can see flowers (roses, pansies...), introduced, as in all Andalusia, by Arab reminiscences. No part of the garden seems to have been left to chance Each space has a specific function, the artificial elements predominating over the natural. The vegetation is limited to evergreen foliage plants, which can be pruned and shaped in specific patterns and sizes. Along the years other deciduous species have been introduced alongside the original vegetation. There are characteristic elements of the Roman period: statues (logically and unfortunately, the owners of the Palace took with them the magnificent statues that could be seen here, and some of these are seen in the House of Pilates in Seville); shallow grottoes and artificial caves made of limestone (only two are preserved) where was recreated the aquatic mythological world with statues of nymphs and water games; porticoes (in particular, the archway which communicates the Palace with the Garden); loggias (this is one of the most interesting features of the garden, as it is a Pompeian “Imafronte” unique in Andalusia, where the statues referred to above were placed along with flowerpots, planters and balustrades). Water is used as a decorative motif and always appears in artificial features, following a straight course forming waterfalls, pools and fountains. You can palpably observe the great importance water has in this garden because there are several pools; the watercourses are now hidden or lost and also seems very likely there once existed a Salpigi system (valves that were triggered by stepping on a membrane, shooting up jets of water to the sudden surprise of those who were walking around the different streets of the garden). Introduces curiosities such as water games, sophisticated decorations or scenarios, a secret garden disappeared in the most part,although there still remains the pool where according to legend the Lady of the Castle bathed (to clean her body) and then went into the chapel attached to the garden (to clean her soul). With regard to plants species, with the passage of time some species that are not from the period of construction have been introduced; among the original flora we can mention the Boxwood (Buxus Sempervirens), Laurel (Laurus Nobilis), Rosemary (Rosemarinus Officinalis), Ivy (Hedera Helix), Myrtle (Myrtus Communis), and Cypress (Cupressus Sempervirens). All the above made up the typical flora in any Renaissance garden; it is also worth mentioning two Magnolia trees which are centenaries; these and a variety of Jasmines, including the Night Jasmine, fill Bornos’ summer nights with rich captivating essences. (Cupressus Sempervirens). All the above made up the typical flora in any Renaissance garden; it is also worth mentioning two Magnolia trees which are centenaries; these and a variety of Jasmines, including the Night Jasmine, fill Bornos’ summer nights with rich captivating essences. In the pools there are Water Lilies of great antiquity. Furthermore we find here two huge bushes of Chinese Orange Blossom, a Jacaranda tree, several Washingtonian Palm trees (in its two varieties, robust and fan palm), a different variety of Rose Bushes and the also remarkable presence of Pansies (the famous "cat’s face flower"), which like the water lilies are very old. There also are a lot of Orange trees (of modern introduction). Etymologically a Loggia is a gallery or succession of arches. Of this loggia, we can say that after the completion of the Renaissance garden of the Palace of the Ribera the Lords of Bornos built an outdoors art gallery; a private museum for their exclusive enjoyment or to proudly impress their guests with those jewels that were the 1st century Roman statues, restored by Giuliano Meniquini, or with those newly sculpted by him with the more pure and perfect forms of the Italian Cinquecento. Years later, when some of the Infants of the Ribera Family were educated in Bornos, these sculptures would be useful when their preceptors put beautiful examples of Greek and Latin mythology, so bringing to life the cold marble and alabaster forms. When we say that this is the only Loggia in Pompeian style in Spain, we refer to a balanced and brilliant architectural composition of Benvenuto Tortello: a succession of arches topped with a Classical Roman frieze (although of a clear Greek inspiration) ornamented by alternating triglyphs and metopes. Tortello came to Spain from Italy called by the Ribera’s to take charge of the construction of new buildings in their lands, as well as to improve or restore the existing ones: with a very distinct purpose, to import the most recent trends of the Italian Renaissance. The Ribera’s helped create a growing interest for the arts and the letters among the Andalusia nobility.The architect Tortello became very well considered in Spain among his contemporaries; and, apart from his works in Bornos, is outstanding his execution of the façade of the Town Hall of Seville in San Francisco Square. The statues that were housed in this Loggia are currently kept by their rightful owners in the House of Pilates in Seville and they have been declared as Artistic Heritage of Andalusia. 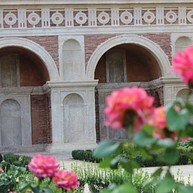 Therefore this Loggia now represents an evocative place in the Gardens of the Castle-Palace of the Ribera’s in Bornos, a renowned setting of great historical and artistic value. The architectonic features of this church belong to two different styles: On the one hand an already greatly reformed primitive Gothic, and on the other the Baroque which influence invaded the entire Church. The date of its construction is unknown but, if we accept the theory of Fray Pedro Mariscal of San Antonio, may be assumed that it was built in the late 15th, or early 16th, century. What is certain is that in 1559 Hernán Ruiz (Grand Master of Seville Cathedral) signed a contract to remove and change "the four old pillars and the arches support stones, pebbles, lime and sand". The existing four columns of the temple are not those that Hernán Ruiz pledged to do, since in the 17th century a great amount of refurbishing works were carried out. The records found of testamentary provisions by some people, requesting to be buried in the Church of Santo Domingo, and the existence of the pillars prior to signature of the contract by Hernán Ruiz, is what makes us date this building as a 15th or 16th century building. The most valuable piece of this church, archaeologically speaking, is the stone that is situated in its facade, embedded to the right of the main door.It says: HIC. RELIQVIAE. SACORV. MATRIUM. ID. SC. TOME. SC. DIONISI. SACORVM. COSME. ET. DAMIANI. SC. AFRE. SC. SEBASTIANI. SC. SABAE. According to Rodrigo Caro, there is a part missing at the beginning, so what can be read there now tells us that there were buried the relics of the holy martyrs: St Tome, St Dionysius, St Cosme, St Daniel, St Afra, St Sebastian and St Sabas. Attached to the façade, is a 31 metre-high Bell Tower built in 1792. In the interior, however, the church is full of artistic treasures. We can highlight the Main Altarpiece, of Baroque style; it is constituted by three sections of two levels with niches, separated by Solomonic columns. The niches of the side sections are occupied by sculptures representing the four evangelists and the bishops Saint Isidoro and Saint Leandro of Sevilla. One of the niches in the central section houses a baroque sculpture representing the Immaculate Conception, above her there is a figure of St Dominic and in the section below there is a 17th century wood carving representing the Jesus Child which is attributed to La Roldana. The Sanctuary Chapel keeps a, very much worshipped, beautiful image of Nuestra Señora del Rosario with the infant Christ asleep in her arms, and holding a beautifully carved half orange, with carved laced work and plaster moulded flowers. As for the image we ignore the name of the sculptor who made it but must have been a good master otherwise he would not have achieved such great beauty and pallor that make a jewel of this image. As for the holy patron Saint Laureano we can not say the same, however we find that his patronage is well documented; he was elected as local patron by popular demand, albeit not solemnly confirmed until September 19 September 1888, by Leon XIII. According to father Mariscal, “the Chapel of the Calvary was mainly built with the donations and request of some devotees of this villa of the surname Soto”. Furthermore “In around 1696, the hermit called Brother Mendoza and born in Cordoba, was admitted into the lodge attached to the chapel; who, with the alms he collected from the villagers, added another room to the Chapel; it was opened on the centre of the back wall and shaped like a quarter sphere. He received great amounts of building materials and much help with his daily livelihood from San Jerónimo’s monastery. He was affected with a final disease when his project was reaching perfection”. According to the Bornense historian Manuel Barra, despite Father Mariscal’s statements, the truth is that who constantly dealt with Brother Mendoza’s needs were the Franciscans of the Convent of San Bernardino de Siena. 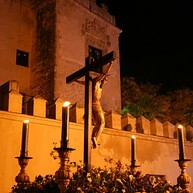 So much so, that they performed a Via Crucis (similar to the one that Don Fadrique Enríquez de Ribera had instituted from the Monastery of the Jeronimo’s), starting from the door of their Convent to the Ermita del Calvario (Calvary Chapel); some crosses and chapels that marked the Via Sacra Stations still remain and are still much visited on Fridays, but especially on Lent Fridays. Stands out the triangular facade offering a beautiful niche topped with a typically Baroque belfry. In this shrine is worshiped a beautiful image of San Francisco de Paula, which dates from the first half of the 18th century. Other deserving images venerated in this chapel are: Santa Rosa de Viterbo (16th century); St. John the Evangelist; an image of the Virgin under the patronage of “Mary Most Holy, Our Sorrowful Lady of Solitude”; and other images of lesser merit but still worthy. We also find here paintings of great interest, as is a 16th century scene of Jesus Being Taken Down From The Cross, of Italian school and which in the past was kept in the chapel of the hospital-asylum, The Blood School. In the 16th century, Don Diego Alvarez, neighbour of Bornos, left instruction in his will for the foundation of The House-Hospital Of The Resurrection Of Our Lord Jesus Christ and also a church. The temple, which is all that remains of the old hospital, appears covered by an extraordinary Mudejar style coffering. 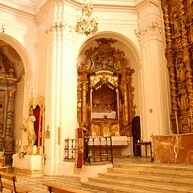 The chapel also keeps a golden altarpiece of Baroque style with niches and Solomonic columns. You will find this noble Baroque building, from the second half of the 17th century, in number 26 Granada Street. A two storey building separated on the facade by a cornice. The facade has a large doorway framed between two Tuscan Order pilasters of fluted shaft and sober entablature, over the entrance and symmetrically centred there is a balcony flanked by the Ordóñez Family Shields. Both the entrance and the coats of arms are carved in pink marbled stone. The different spaces and chambers are organized around a main courtyard with upper gallery; at ground level we find a first body of arches resting on Tuscan marble columns, the upper level is a gallery of rectangular balconies. There is also an additional yard, simpler, with a gallery of arches at ground level on one side and on the upper level of the other side a landscape-observation gallery crowned by cubical body battlements with pyramidal tops. The structure's load-bearing walls are made of rammed earth and slab with fully treated and restored wooden beams for its floors an ceilings. The House was inhabited by the Muñóz of Mendoza family. This family was closely related to the Brotherhood of the Resurrection, now known as the Brotherhood of the Flagellation of Christ and Our Lady of the Greater Pain. The headquarters of this brotherhood are in Granada Street. The relationship of this lineage with the brotherhood is documented in the book "Churches and Chapels of Bornos" of the local author don Manuel Barra Rodríguez, favourite son of the Villa of Bornos, posthumously. Catalina Muñóz de Mendoza, an heiress of the Muñóz family, married on 9 November 1742 to Francisco Ordóñez Lobatón, Mayor Ensign of Bornos (1765) and Lieutenant of the Mayor of Bornos (1777), hence giving the name of "Ordoñez" to the House. In Bornos on the 22nd of December 1746 a son was born of this match, Bartolomé Ordóñez and Mendoza Muñóz Jiménez Lobatón and Carrasco. He became Knight of Ronda, Supernumerary Gentleman by Royal Decree of 15 June 1790, Mayor of Bornos in 1776 and 1782 and was named Knight of the Order of Carlos III, record 478, approved on 22 February 1791. Centuries later, on 14 April 1954, Francisco García Perez and Garcia-Zapata, as executor of Doña Ana Pérez of Grandallana and Zapata, disposes that all assets and rents, house and gardens be used to establish a foundation for a free school for poor children, where the children be taught according to the dogmas of the Roman Catholic Religion, at all times; he also predisposed that, so as to ensure a prosperous life for this foundation, the organisers could admit some public pupils from Bornos and Arcos thus collecting funds to allow a larger number of poor children to attend this centre. The benefits obtained from the Orchard of the Ordóñez were to be used for the keep of the teachers employed; in addition Ana left 37,500 pesetas to carry out whatever building works were necessary to turn the house into a school and to buy school materials. This entity was called The Non-Profit Foundation "Ave Maria School". It finally closed in 1977 and their assets, house and garden, were sold to Bornos Council for 110,000 y 120.000 pesetas, respectively. Don Per Afan de Ribera, first Duke of Alcalá, Marquis of Tarifa, who died in Naples in 1571, disposed in his will the construction of an Asylum-Hospital, also School, to give home to twelve Noble Squires at the service of the Lord Duke, and other men good and clean blood, from his State. The work’s executor was the testator’s illegitimate son, Don Juán de Ribera who was Patriarch of Antioquia and Archbishop of Valencia; today known as San Juán de Ribera. When the works were half way through, the illustrious Lord Patriarch came to see the building and he found it to be too big, with housings on the upper storeys and many staircases, for these reasons he disliked the place, finding it inadequate to accommodate elderly people, and ordered the works to be stopped. However so as to fulfil his father’s wishes he took some land opposite the original buildings and ordered to buy the adjacent houses in the same square where a more functional, comfortable and cosy building was erected. The first edification was destined to become a nun’s convent, authorized by Pope Clement VII in 1593. In 1597 the convent was inaugurated, being the first nuns to occupy it of the Cistercian Order, from the College of Las Dueñas in Seville. These nuns, not happy with the convent, decided to return to Seville and then, by request of the Patriarch, there came from Alcalá de Los Gazules, four Clarissian nuns of the Franciscan Order who stayed on. Finally the Foundation was consolidated and survived until the year 1973 when was abandoned for being in most of its totality in ruins. 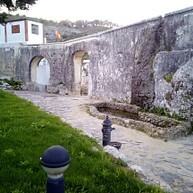 During this period the convent suffered several fires, the worst being in 13th April 1685 when the chapel was completely destroyed and rendered useless, there only remained standing a transverse arch with two coats of arms of the House of Alcalá, there were also found documents about legal quarrels between the Nuns, the Ecclesiastical Tribunal and the Founders. After its total neglect the City Council bought the building. 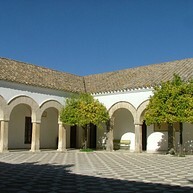 A year later it was granted to Caja de Ahorros in Jerez, who renovated and turned it into a Vocational Training Centre. It now houses the Institute of Secondary Education "The Convent". In 1997 the building celebrated the IV Centenary of its foundation. The building itself consists on two floors, with an arcaded courtyard of semicircular arches on the ground floor. The entire structure is built in stone and brick. In addition, it has a beautiful staircase with a superb carved stone balustrade and a domed ceiling with a magnificent decoration. There still can be found some features of great interest like two tombstones set in the wall of the Library (formerly the Sacristy) which belong to Lord Francisco Enríquez de Ribera and his wife Lady Leonor Ponce de Leon, founders of the Monastery of Ntra. Señora del Rosario (Our Lady of the Rosary), where they were originally buried; their remains and tombstones were transferred to The Convent of the Corpus Christi in 1862. Another interesting feature which has survived from the time of its Foundation is a Well with a wheel system moved by donkeys, preserved in solid masonry with a spiral staircase to the Well which supplied water for the of adjacent gardens;These are still cared for and well kept as a relaxing area for teachers and other staff, and as playground for students. This mill is a part of a series of hydraulic constructions along the "Ribera de los Molinos" (The Mills Riverbank) there were at least ten Mills constructed around the 16th century, some of them even from Arab origin, which supplied water to the whole town and the abundant orchards of Bornos. This building, popularly known as The Wide Mill, is one of the best preserved sections of this waterway and corresponds with the Leverage of the typical arches mills; the Leverage is the architectural resource that allows the right slope to provide an adequate height for the vertical drop of the water into the bucket; and the Leverage of this mill was built by way of two large, quite unique arches, with buttresses. The spillway is the gate to regulate the amount of water that flows into the bucket and is striking the accumulation of limestone concretions on the spillway door of this mill, a clear proof of the number of centuries of good service. We can appreciate the bricks covering its interior and the magnificent buttresses. Touristic and Sport Complex "Embarcadero"
In Bornos you can practice all kinds of sports: water sports, land sports and aerial sports. 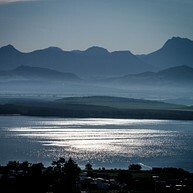 The wide network of trails that Bornos has, the spectacular landscapes that we can enjoy with the Sierra and the Reservoir make it one of the best choices for sports. If we add to this the cultural and tourist offer that it offers throughout the year, it makes us a tourist and sports destination chosen by many visitors from all over the country and abroad. Bornos is a perfect destination for sport in any of its modalities, and enjoy in parallel of the traditional gastronomy, an extensive Heritage and the hospitality of its unequaled people. 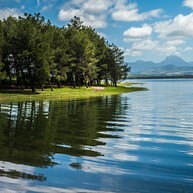 The Bornos reservoir, with its calm waters, encourages the practice of water sports. We can enjoy many sports such as canoeing, sailing, windsurfing, water skiing, fishing, kite surfing, kayaking, parasailing, stand up paddle, fly board, banana boat, etc. We have facilities that offer us the possibility of acquiring the necessary tools for sports practice. The Club Deportivo de Vela Lago de Bornos (www.facebook.com/nauticolagodebornos), the Center for Tourist Activities (www.facebook.com/CATBornosActivo), on the banks of the river, make it possible to practice these sports by facilitating with their complete facilities the approach of both the neophyte and the professional to the development of these sports disciplines. Declared of Tourist Interest of Andalusia (February / March) The Carnival is currently the most outstanding and ingrained party of Bornos in which people is the main protagonist. Its defining elements are given by the widespread use of disguise and mask, as well as the presence in the streets of groups, such as chirigotas, comparsas, or a special type of murga that is indigenous to Bornos. 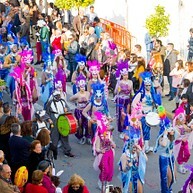 Two weeks before the party, the Peña Carnavalesca de Bornos organizes the "Morcillá Popular". Beer and blood sausage can be tasted for free while the groups participating in the party present their songs. A provincial contest is held every year in the auditorium of the Corpus Christi Convent. Groups from the whole area participate. In any act of the contest you can enjoy an atmosphere of genius and magic. The most spectacular and sensational day of the Bornos Carnival takes place on the second weekend in the so-called Domingo de Piñata, the day when the parade is celebrated with parades of floats, masks, costumes, in which Bornos makes a waste of ingenuity, originality, humor and fantasy and during which participants compete for the best disguise. An ancient, traditional Carnival, full of fun, joy and color. September in Bornos and the last of August in Coto de Bornos. Bornos currently has a fairground where you can fully enjoy these wonderful days to mark the sevillanas and accompanied by a good wine from the Jerez area. There is a great hobby in Bornos for horses and "sevillanas"(typical song in fair).